Director Ang Lee has a surprising affinity for the Indian hero of Life of Pi — that's his name, Pi, and he's seen at several ages but principally as a 17-year-old boy adrift on a lifeboat in the South Pacific. He's the lone survivor of a shipwreck that killed the crew, his family and a variety of zoo animals his father was transporting to North America for sale. Actually, Pi is the lone human survivor. 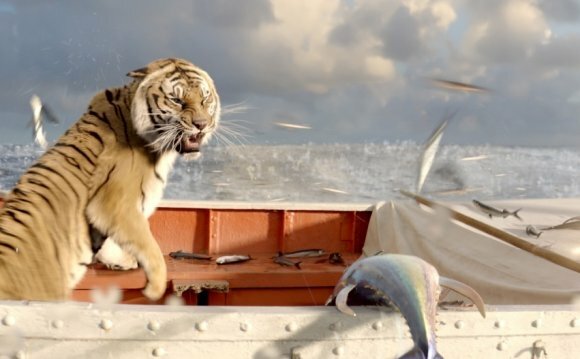 He shares his boat and its dwindling food supplies with a man-eating Bengal tiger. Lee is a director whose works I've admired more than loved. All of his movies — among them Sense and Sensibility, Crouching Tiger, Hidden Dragon, Brokeback Mountain, even Hulk — center on emotions that bump up against rigid codes of behavior — emotions that can't be suppressed and finally erupt. Lee's range of genres and settings is impressive, but there's something about his meticulousness that keeps me at a distance. I know that many people loved Brokeback Mountain, but I got hung up on the mythical cowboy iconography, that forbidden love sanctified by purple mountain majesties. Lee makes movies about giving in to passion — without seeming to let go. But Life of Pi is different. Most of the film is a flashback, a tale told to a writer by the middle-aged Pi. And the way Lee depicts it — in a style that's typically fastidious and arty — is astonishingly in sync with his narrator. That lifeboat in which most of the movie takes place is a wondrous set, not realistic but not fake, either — transcendentally in-between. The water is ultra-ultramarine, the sea a mirror in which clouds above seem to mingle with sharks, dorados, luminous jellyfish, even whales below. The orange of the tiger burns as bright as in William Blake's immortal poem. The 3-D is brilliantly effective in creating multiple planes of reality, and it also allows Lee to hold shots for longer than any studio would let him if not for that marvelously immersive technology. This isn't just a gorgeous survival story: The search for higher meaning runs all through the movie, as it does through Yann Martel's best-selling novel. Growing up, Pi was drawn to multiple faiths. He thanks Vishnu for introducing him to Christ while rolling out his prayer mat to honor Allah. The kid subscribes to everything. But on the lifeboat, it seems as if none of his many gods will even acknowledge his existence. He's terribly alone — except, of course, for you-know-who. As if being lost at sea isn't daunting for a teenager, Pi's companion on his lifeboat is a Bengal tiger. Life of Pi is based on Yann Martel's 2001 Man Booker Prize-winning novel. And talk about a mismatched buddy picture! Because of a bureaucratic screw-up, the tiger bears the name of the man who caught him — Richard Parker. But despite that human moniker, the beast is never anthropomorphized. For long stretches, Pi stares at the tiger with both awe and dread. The young actor Suraj Sharma has a good, wiry presence — he's alert to everything, as he needs to be. Irrfan Khan as the older Pi has the more thankless job, largely just sitting and telling his story to a writer played by Rafe Spall. Those framing scenes are awfully clunky, but against all odds they pay off. The movie has a sting in its tail that puts what you've seen in a startlingly harsh context. The overcontrolled Lee has gone with his strengths and made a movie that's passionately overcontrolled. If it seems one step removed from reality, under glass, with twinkles of magic that are obviously computer-generated, well, that penchant for artifice is the key to the film. Like Pi, Lee believes with all his heart in the transformative power of storytelling. Only one thing about this lovely movie saddens me. Once upon a time, audiences would say, "Wow! How'd they do that!!??" Some people might read about how it was done later; most would never find out. Now, you can't get away from the behind-the-scenes documentaries on cable and the Internet. The DVD will have a raft of extras showing Richard Parker and that lifeboat at every stage of its computer generation. I wish we could just say, "Wow!" and leave it at that.